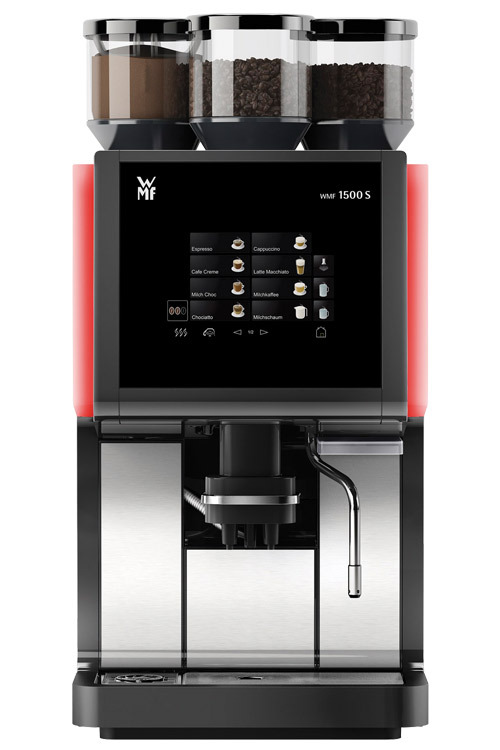 Based on the NEW GENERATION-Platform, the WMF1500S is the successor of our top-seller coffee machine – the WMFpresto!. The previous variations have convinced our customers through price performance, slim design and excellent coffee quality. As the subsequent model, the WMF1500S includes all of the great qualities of our previous models and improves upon them in many areas. The new design and the black touch screen immediately catch the eye. The optional EASY MILK-System for hot milk, hot milk foam and also cold milk, opens up entirely new opportunities. With rock-solid workmanship and high-quality components, the WMF1500S ensure that your guests can be spoiled with high-quality coffee, day after day and well into the future. With the WMFSteamJet every cup will be at the required temperature within seconds! In this heated cup, your Cafe Creme or Espresso keeps longer its warmth. With the new DYNAMIC MILK-System the WMF1500S provides hot and cold milk, hot and cold milk foam – fully automated through the beverage spout. With its revolutionary “Man Machine Interface” Touch Display, the WMF1500S makes everything quick to understand and easy to use. For guests in self-service it is incredibly easy to create a perfect coffee quality! The WMF1500S milk system offers BASIC MILK and EASY MILK options. In addition to hot milk and hot milk foam, the EASY MILK-System enables you to prepare new drink beverages with cold milk. The WMF1500S offers you the possibility of hot milk foam or hot milk with the manual BASIC STEAM-variant. With a lot of fresh milk you are almost able to prepare almost every chocolate and coffee creation. With 8 beverage buttons on 6 levels you can program a total of 48 beverages. You can also store your own coffee recipes and images. In just a few, small steps the WMF1500S becomes a real self-service specialist: alternate between single and double spout, and choose the choose the single-line display format in the display – done! You can use the Remote Data Access (RDA) option to access your information at any time. This aids transparency if you have several machines and helps you stay on top of things. The height of the spout for coffee can be manually adjusted with one hand. The clearance height (up to 175mm) enables the filling of a pot for breakfast or usage in the office. Maintenance work like a seal replacement on the easy-to-remove brewer can easily be done by oneself. Therefore your machine will be a rare sight for the WMF service technician. Automatic cleaning can be activated using the Touch Display. Once you have inserted a cleaning tablet, all coffee-related components will be automatically cleaned. Reduced energy consumption, decreased chemical usage and approaching outright recycling throughout the company, are just some of the components of the sustainable WMF concept.